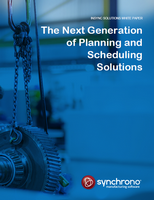 Production planning, scheduling and execution software. Data. People. Materials. Machines. Every resource key to your entire supply chain. Synchronizing demand-driven manufacturing processes to eliminate chaos and lower costs sounds great. But to do it, you need to be in control. In real-time. Minute-to-minute. 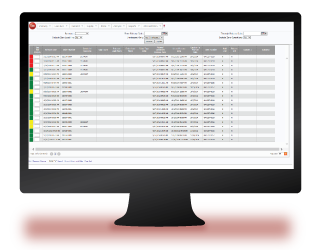 Our patented SyncManufacturing®, demand-driven production planning, scheduling and execution software synchronizes and prioritizes your entire order-to-delivery cycle. Adjust production priorities based on changes in demand, without running a function or firing off emails or making phone calls to say there’s been a change of plans. Our demand-driven software is comprehensive and adaptive — and it operates in real-time. Which means it automatically synchronizes processes operation-wide, before you panic. SyncManufacturing® software simplifies production scheduling, eliminating the need to build and update manufacturing schedules. When orders are received, the system will calculate materials, production availability and constraints. And our exclusive CONLOAD™ technology ensures that the work released to the shop floor is in full alignment with constraints, clearing any congestion and driving flow. Order statuses (and related issues) are visible throughout your organization, so your production team, supply chain management, customer service, sales and leadership are all working from the same factual, up-to-the-minute information. Variability may be a way of life in manufacturing, but how you respond to it is what determines success. SyncManufacturing® software delivers actionable information that allows you to manage and respond to variability before it undermines your production. Whenever an order is moved within our system, the priorities of all operations and materials are automatically re-prioritized and re-synchronized in real-time — without any scheduler intervention. 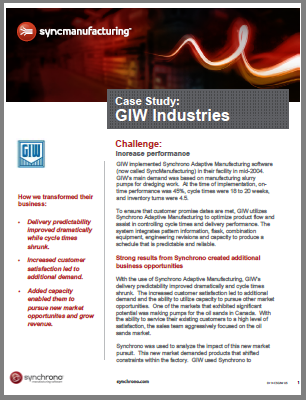 Eliminate guesswork for sales, customer service, engineering and purchasing. Our release schedule relies on material requirements based on actual production and performance — rather than projections or promises. This is how SyncManufacturing® aligns execution and eliminates unproductive buffers between organizational silos. Our production reporting features offer analytical tools and real-time data that allow you to track, predict and improve the performance of critical operations. Convenient drag-and-drop features simplify input modification, too. Because it’s web-based, SyncManufacturing® demand-driven manufacturing software is easy to implement and integrate with your existing systems. So you’re seeing a measurable ROI quickly. Let us show you how SyncManufacturing® software can synchronize and prioritize your entire supply chain – contact us to request a private demo. Watch a recording of a SyncManufacturing software demo. 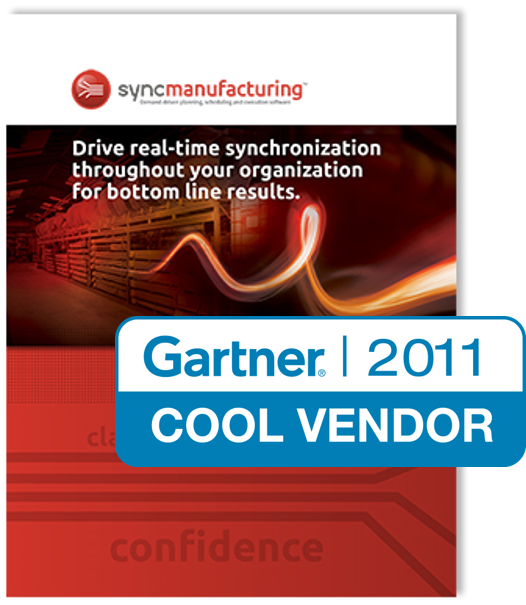 Gartner, Cool Vendors in Manufacturing Operations, 2011, 13 April 2011.